The tax deadline is here and our Verify team is answering any last-minute questions you have. West Virginia viewer Nancy Lutz asked the Verify team to research whether tax preparation businesses lobby legislators to set for rules for how we file our taxes. H&R Block dropped $4 million in lobbying last year, with taxes also being their number one issue. To find out, Verify researchers checked out data from the nonprofit Center for Responsive Politics. 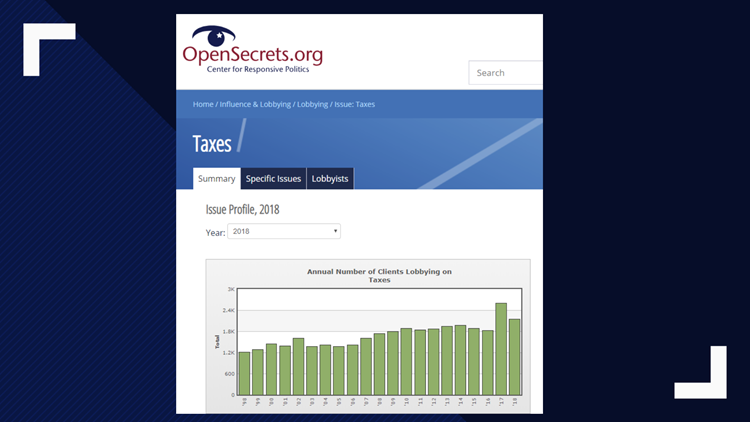 Companies like Intuit, that owns TurboTax spent $2.6 million on lobbying, more specifically focusing on tax issues including tax reform in 2018. H&R Block dropped $4 million in lobbying last year, taxes also being their number one issue. Both Intuit and H&R Block lobbied for and backed the Free File Act of 2016, now Free File Program by the IRS, where people who earn below $66,000 a year can file taxes for free through software provided by for-profit companies. The Taxpayer First Act of 2019, passed on April 9 by the Ways and Means Committee. It includes a provision requiring the IRS to continue work with private stakeholders in maintaining the Free File Program. Under agreement, the IRS cannot compete with commercial tax prep businesses by providing their own free filing service. So, we can Verify that certain tax prep companies have lobbied on issues related to tax filing protocol.